When we’re not in front of a TV or computer screen, many of us spend the day attached to our phones, checking them long after the natural light has faded outside. 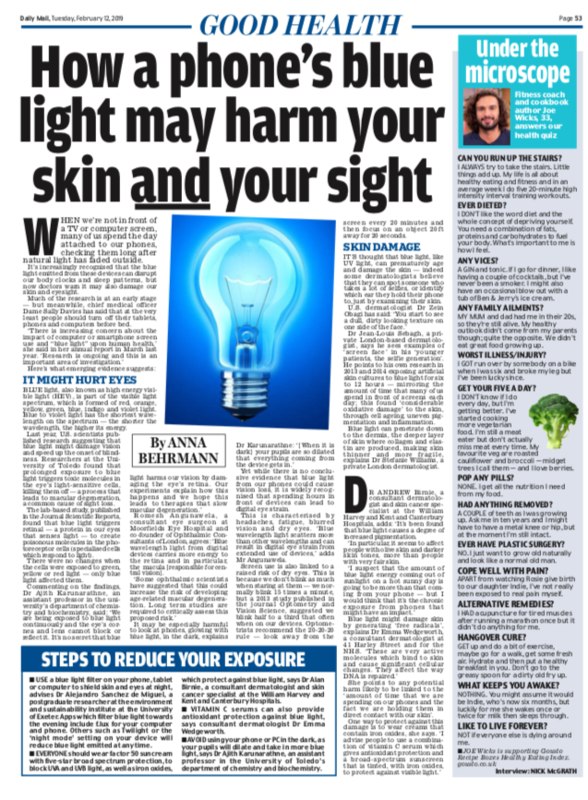 USE a blue light filter on your phone, tablet or computer to shield skin and eyes at night, advises Dr Alejandro Sanchez de Miguel, a postgraduate researcher at the environment and sustainability institute at the University of Exeter. Apps which filter blue light towards the evening include f.lux for your computer and phone. Others such as Twilight or the ‘night mode’ setting on your device will reduce blue light emitted at any time. EVERYONE should wear factor 50 suncream with five-star broad spectrum protection, to block UVA and UVB light, as well as iron oxides, which protect against blue light, says Dr Alan Birnie, a consultant dermatologist and skin cancer specialist at the William Harvey and Kent and Canterbury Hospitals. VITAMIN C serums can also provide antioxidant protection against blue light, says consultant dermatologist Dr Emma Wedgeworth. AVOID using your phone or PC in the dark, as your pupils will dilate and take in more blue light, says Dr Ajith Karunarathne, an assistant professor in the University of Toledo’s department of chemistry and biochemistry.